“Taking the long road, doing the right thing, and using your words and actions that didn’t involve letting fists fly, was harder and way more time consuming than just punching a dude in the face a few times and going out for a beer after.” (Kindle Locations 2431-2432). Autumn Amanda Price is the daughter of a preacher. The stigma of growing up a preacher’s daughter leaves her unprepared to deal with some of the darker parts of reality, but not at all from exploring her own desires. Zander (redubbed Revelator when he patched into the MC) almost shows his interest in Mandy too late and he has to work even harder to win her affections. Mandy’s dark secrets will come out in the open when all her friends don’t let up trying to help her. How will the MC proceed with this new conundrum, will they go back to their old ways or forge a new path? I love AJ Downey’s writing style and how she describes the world in the Sacred Hearts MC. All her characters come alive and every book is interconnected with the others through the overarching story-line and the characters’ involvement in each other’s lives. Mandy is the ultimate unreachable girl. She’s a preacher’s daughter and supposedly innocent of the more sexual things, but she is ready to party and ready to play. She’s fun and vivacious, but she’s stuck in her past and stuck in her family secret. It was interesting to watch Revelator get stuck along with her in her family’s problems. A true relationship means that you are involved in your significant other’s family and that your partner’s problems become your own. Rev doesn’t pause to think about any of this, he is ready to lay down the law and jump into problems headfirst if it means protecting or helping his Mandy girl. Downey changes the game with this book. 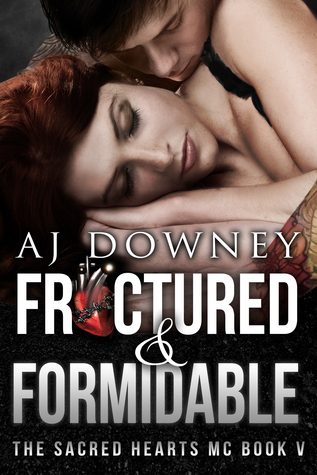 No spoilers, you have to read for yourself, but leading up to the last book in the series, Fractured and Formidable is full of twists and turns. This novel was published by Second Circle Press on July 1st, 2015 and is available on Amazon here.